Saint Francis Xavier (Basque: San Frantzisko Xabierkoa; Spanish: San Francisco Javier; Portuguese: São Francisco Xavier; Chinese: 聖方濟各沙勿略) (April 7, 1506 – December 2, 1552), a pioneering Roman Catholic Christian missionary and co-founder of the Society of Jesus (Jesuit Order), was instrumental in the establishment of Christianity in India, the Malay Archipelago, and Japan. The Roman Catholic Church considers him to have converted more people to Christianity than anyone else since Saint Paul, and he was made a Roman Catholic saint on October 25, 1619. In 1529, while attending the University of Paris, Xavier became acquainted with Ignatius Loyola, who had undergone a profound religious conversion and was gathering about himself a group of men who shared his ideals. Together with five others, they founded the Society of Jesus on August 15, 1534, by taking a vow of poverty and celibacy at a site now in the Montmartre area of Paris. King John III of Portugal asked for diligent priests to evangelize and minister to the Christians in his new Asian dominions, and on March 15, 1540, Xavier left Rome for the Indies, arriving in Goa, the center Portuguese activity in the East, on May 6, 1542. He spent the next three years mostly on the southeastern coast of India among the simple, poor pearl fishermen, the Paravas, and then baptized the Macuans on the southwestern coast. In the fall of 1545, he went to the Malay Archipelago, where he spent several months evangelizing in Malacca, then laid the foundations for a permanent mission in the Maluku region among the people of Ambon Island, Ternate, and Morotai (or Moro). In 1548 he returned to India, where more Jesuits had since arrived to join him, and became interested in Japan. On August 15, 1549, he arrived in Kagoshima, Japan, and by late 1551, when he left for India, he had found two thousand converts there. Xavier died of a fever on December 2, 1552, on the island of Sancian (now Shang-ch'uan Tao), while attempting to secure entrance to China. According to a family register, Francis was born Francisco de Jasso y Azpilcueta on April 7, 1506, in the castle of Xavier (or Xavero) near Sangüesa and Pamplona, in the Kingdom of Navarre (now in northern Spain), where Basque was the native language. He was the third and youngest son of Juan de Jasso, privy councillor to King John III of Navarre (Jean d'Albret), and Maria de Azpilcueta y Xavier, sole heiress of two noble Navarrese families Following the Spanish custom of the time, he was given the surname of his father and his mother; his name is accurately written Francisco de Xavier (Latin Xaverius) rather than Francisco Xavier, as Xavier is originally a place name. In 1512, many fortresses were devastated, including the family castle, and land was confiscated by the crown of Castile. Francis' father died in 1515. Francis grew up at Xavier and received his early education there. Like many younger sons of the nobility, he was destined for an ecclesiastical career, and in 1525, at age nineteen, he went to study at the University of Paris, where he received a licence ès arts in 1530. He furthered his studies there in theology. In 1529, Ignatius Loyola, another Basque student, was assigned to room with Francis. Fifteen years older than Xavier and a former soldier, Loyola had undergone a profound religious conversion and was then gathering about himself a group of men who shared his ideals. Gradually he won over a recalcitrant Francis, and together with five others, they founded the Society of Jesus on August 15, 1534, taking a vow of poverty and celibacy at a site now in the Montmartre area of Paris. They vowed to live in imitation of Christ, and solemnly pledged to undertake a pilgrimage to the Holy Land and then to devote themselves to the salvation of believers and unbelievers alike. Francis then performed the Spiritual Exercises, a 30-day series of meditations devised by Ignatius, based on his own experience of religious conversion, to guide the individual toward greater generosity in the service of God and man. This experience helped Francis Xavier develop the motivation that carried him for the rest of his life, and prepared the way for his recurrent mystical experiences. When all seven members had completed their studies, they met in Venice, where Francis was ordained a priest on June 24, 1537. After unsuccessfully seeking passage to the Holy Land for more than a year, the seven, along with fresh recruits, went to Rome to put themselves at the disposal of the pope. As a result of their preaching and caring for the sick throughout central Italy, they had become much in demand, and several Catholic princes sought their services. One of these was King John III of Portugal, who wanted diligent priests to evangelize and minister to the Christians in his new Asian dominions. When illness prevented one of the two originally chosen for the task from departing, Ignatius designated Francis as his substitute. Francis left Rome the next day, March 15, 1540, for the Indies, traveling first to Lisbon. That autumn, Pope Paul III formally recognized the followers of Ignatius as a religious order, the Society of Jesus. Francis arrived in Goa, the center Portuguese activity in the East, on May 6, 1542; his companion had remained behind to work in Lisbon. He spent the next three years mostly on the southeastern coast of India among the simple, poor pearl fishermen, the Paravas. About 20,000 of them had accepted baptism seven years before, in order to secure Portuguese support against their enemies; since then, however, they had been neglected. Francis translated a small catechism into native Tamil with the help of interpreters, and went tirelessly from village to village instructing and confirming the new converts in their faith. His evident goodness and the force of his conviction made a deep impression on them. Shortly afterward, the primitive Macuans on the southwestern coast requested baptism, and, after brief instructions, Francis baptized ten thousand of them in the last months of 1544. He organized schools to help maintain their new faith. In the fall of 1545, new opportunities for Christianity attracted Francis to the Malay Archipelago. He spent several months evangelizing among the mixed population of the Portuguese commercial centre at Malacca, then went to found missions among the Malays and the savage headhunters in the Spice Islands (Moluccas). Francis Xavier's work initiated permanent change in eastern Indonesia, where in 1546-1547 he worked in the Maluku region among the people of Ambon Island, Ternate, and Morotai (or Moro), and laid the foundations for a permanent mission. In 1548 he returned to India, where more Jesuits had since arrived to join him. In Goa, the College of Holy Faith, founded several years previously, was turned over to the Jesuits, and Francis began to develop it into a center for educating native priests and catechists for the diocese of Goa, which stretched from the Cape of Good Hope, at the southern tip of Africa, to China. Francis now became interested in Japan, which had been reached by Europeans only five years earlier. In Malacca he had met Anjiro, a Japanese deeply interested in Christianity, and through their conversations had realized that the Japanese people was cultured and sophisticated, unlike the fishermen in India or the headhunters of the Moluccas. On August 15, 1549, a Portuguese ship bearing Francis, the newly-baptized Anjiro, and several companions entered the Japanese port of Kagoshima. Xavier's first letter from Japan, which was reprinted more than 30 times before the end of the century, expressed his enthusiasm for the Japanese, “the best people yet discovered.” Xavier discovered that his lifestyle of poverty, which had so inspired the Paravas and Malays, often repelled the Japanese, and abandoned it for one of studied display and dignity. Late in 1551, having received no mail since his arrival in Japan, Francis decided to return temporarily to India, leaving his companions to care for about 2,000 Christians in five communities. In India, he was delayed by his administrative responsibilities as the superior of the new Jesuit Province of the Indies. Meanwhile, he had come to realize that in order to convert Japan, it would be necessary to understand China; it was to the Chinese that the Japanese looked for wisdom. Xavier determined to travel to China, and traveled to the island of Sancian (now Shang-ch'uan Tao, off the Chinese coast) to attempt to secure entrance to the country which was then closed to foreigners. On November 21, on Shangchuan Island, Xavier fainted after celebrating mass. He died of a fever on December 3, 1552, at the age of 46, without having reached mainland China. He was first buried on a beach of Shangchuan Island. In February 1553, his intact body was taken from the island and was temporarily buried in St. Paul's Church in Malacca on March 22, 1553. An open grave in the church now marks the place of Xavier's burial. Pereira came back from Goa, removed the corpse shortly after April 15, 1553, and moved it to his house. On December 11, 1553, Xavier's body was shipped to Goa. 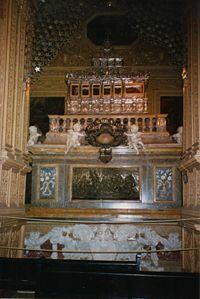 The body is now in the in the Basilica of Bom Jésus in Goa, where it was placed in a glass container encased in a silver casket on December 2, 1637. The right forearm, which Xavier used to bless and baptize his converts, was detached by Pr. Gen. Claudio Acquaviva in 1614 and has been displayed since in a silver reliquary at the main Jesuit church in Rome, Il Gesù. Francis was beatified by Paul V on October 25, 1619, and was canonized by Gregory XV on March 12, 1622, at the same time as Ignatius Loyola. He is the patron saint of Navarre, Spain; Nasugbu, Batangas, Philippines; Australia; Borneo; China; the East Indies; Goa, India; Japan; New Zealand, and of missionaries. His feast day is December 3. In 1927 he was named patron of all missions. Many regard Francis as a saint who brought the Christian faith to Asia. In the Roman Catholic Church he is commonly known as “St. 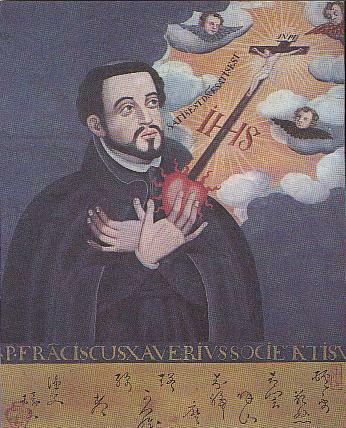 Francis Xavier, the Patron Saint of the East,” and is still prayed to and honored as a pure representative of Jesus Christ and his gospel by Christians all over the world. Innumerable hospitals, schools, and other institutions in India are named after him. Francis is noteworthy for his missionary work, both as an organizer and a pioneer. He developed Jesuit missionary methods that subsequently became a successful blueprint for his order to follow. His efforts left a significant impression upon the missionary history of India and, as one of the first Jesuit missionaries to the East Indies; his work is of fundamental significance to the propagation of Christianity in China and Japan. Twentieth-century scholarship has dispelled many of the legends and the criticisms connected with Xavier. A modern estimate puts the figure of those baptized by him at about thirty thousand, as opposed to the one million asserted by Baroque legend. Francis did not possess the gift of tongues attributed to him, and had to struggle with language wherever he worked. He is justly credited for his concept that a missionary must adapt to the customs and language of the people he evangelizes, and for advocating the education of a native clergy, initiatives not always followed by his successors. Research has shown that he always provided for the continuing pastoral care of the communities he founded and did not abandon them after baptism, as some critics maintained. Many of his own efforts were directed to instructing those baptized hastily by others. The areas he evangelized in India have remained Catholic to the present day. During the seventeenth century, prolonged persecution destroyed the missions he founded in the Moluccas and Japan, but only after thousands had died as martyrs. After he left Maluku, others carried on his work and by the 1560s there were ten thousand Catholics in the area, mostly on Ambon. By the 1590s there were between 50,000 and 60,000. ↑ Cappella di san Francesco Saverio. Il Gesù (in Italian). Retrieved June 20, 2007. Brodrick, James. 1952. Saint Francis Xavier, 1506-1552. New York: Wicklow Press. Gowen, Herbert H. 1967. Five Foreigners in Japan. Freeport, NY: Books for Libraries Press. Jackson, Samuel Macauley (ed.). 1969. The New Schaff-Herzog Encyclopedia of Religious Knowledge. Grand Rapids, MI: Baker Book House. Mendonça, Délio de. 2006. Saint Francis Xavier in India. Goa, India: Délio de Mendonça. “The Miracles of St Francis Xavier” by Fr. John Hardon, S.J. This page was last modified on 24 April 2017, at 22:50.